Between 1844 and 1866 thousands of emigrants, gold seekers, and Mormons moved west through the Platte Valley. The first settlers along Wood River 1858-60 operated road ranches to serve travelers. They included Patrick, Richard, and Anthony Moore; James Jackson; and a Mormon, Joseph E. Johnson. In this immediate vicinity was Jackson's store, opened about 1864, and Moore's Ranche. Johnson's Ranche, also known as Wood River Center, was at the present site of Shelton, Nebraska. 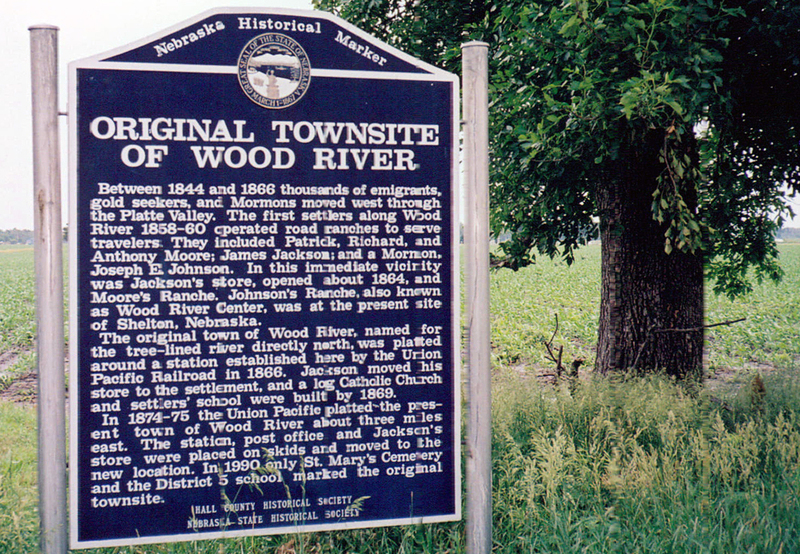 The original town of Wood River, named for the tree-lined river directly north, was platted around a station established here by the Union Pacific Railroad in 1866. Jackson moved his store to the settlement, and a log Catholic Church and settlers' school were built by 1869. In 1874-75 the Union Pacific platted the present town of Wood River about three miles east. The station, post-office, and Jackson's store were placed on skids and moved to the new location. In 1990 only St. Mary's Cemetery and the District 5 school marked the original townsite. “Original Townsite of Wood River,” Explore Nebraska History, accessed April 18, 2019, https://mynehistory.com/items/show/255.